Has the time come for a dining-room-table upgrade? Do you need an attractive, solidly built table for a new home? 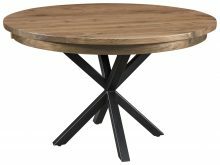 Solid wood Single Base Tables work well in smaller dining rooms where floor space is at a premium. Multiple round, oval and rectangular tabletop configurations are available, making it easy to find the table that suits your design preferences. And youll love the way your beautiful table will look in your dining room! 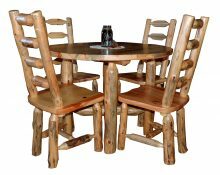 Traditional Amish solid wood furniture is renowned the world over for its good looks and sturdy construction. Shaker and Mission style furniture is more than simple furniture: It’s designed to last for generations and be passed on as a treasured family heirloom. That’s why Amish furniture has the reputation it does today, and why so many families across the country already own this revered furniture. Do you ever watch those shows on TV that go around discovering valuable antiques in people’s homes? It’s quite common to see traditional Amish furniture being recognized for its design, details, finish and excellent condition, even after a century. While we can’t all purchase original pieces, you can buy a modern version that is every bit as beautiful and functional as the original. 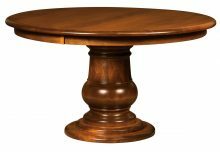 Take our Amish solid wood single base tables. Many of the designs go back generations to the original shapes and styles first produced by Amish artisans so long ago. Others are more contemporary versions that still carry the classic aesthetic of the originals, but include some more modern flourishes and features for a new twist. 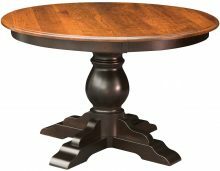 If we offer so many versions of the Amish solid wood single base table in our catalog, it’s because we like giving our customers choices. It can be frustrating to walk into a big box store and discover that you only have a few different table options to choose from. Instead of being forced to pick a table that’s been mass-produced for countless homes, choose and customize an AmishOutletStore.com table that suits your needs and home perfectly. You’ll even get to choose the type of wood and stain. You’ll have no problem matching your current kitchen or dining room furniture and existing décor. All table leaves are 12 inches wide unless otherwise specified, so you can find a table to fit your space. So much of todays furniture is mass-produced in overseas factories where the emphasis is on quantity instead of quality. Our dining room tables are still made the old-fashioned way: one at a time and completely by hand. Our location in the heart of Ohio Amish country gives us easy access to some of the most talented Amish artisans in the entire USA. They use only the highest-quality northern kiln-dried hardwoods such as maple, oak, cherry and quarter-sawn white oak to expertly handcraft heirloom-quality furniture pieces that stand the test of time. The advantages of authentic Amish furniture go deep. 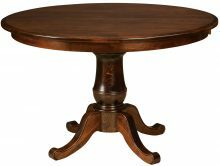 Beautiful hardwood, solid construction and deep, rich stains make each single base dining table a work of art. You can also rest assured that we never use pressboard or particle board in our furniture. Those sub-standard materials only last a short time before they show signs of wear and tear — they can absorb moisture and warp, the veneers can be easily scratched and worn and the attaching hardware can be loosened or pull out completely. Don’t fill your home with throw-away furniture that will need to be replaced in a few years. Instead, invest in quality American-made solid wood furniture that you’ll pass on to your children, and they’ll pass on to their children. You’ll spend many great moments gathered around your Amish single base table with your family and friends. Make sure your table is worthy. You’ll easily customize one right here on our site to match your other dining room or kitchen furniture and décor. If you also would like to purchase new chairs, you can find pieces that go perfectly with your new AmishOutletStore.com table. Simply click through our dining collections and choose the chairs that match, or choose contrasting chairs if you like a more eclectic style. That’s the great advantage of our site: There’s almost no limit to the number of ways you can create the perfect furniture for your home! If youre looking to save money on Amish-made furniture, youve come to the right place! 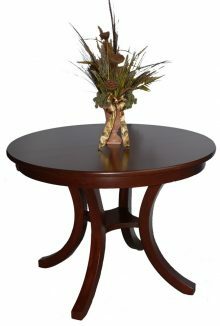 Purchase any Single Base Table today and get up to 33% off the regular retail price. A discount for large orders is also available, and you can even get an additional 3% off for paying by check. Our friendly customer service representatives can help you find the best ways to reduce your furniture costs and sort through the dozens of tables we currently offer for sale. Order your solid wood Single Base Table today!